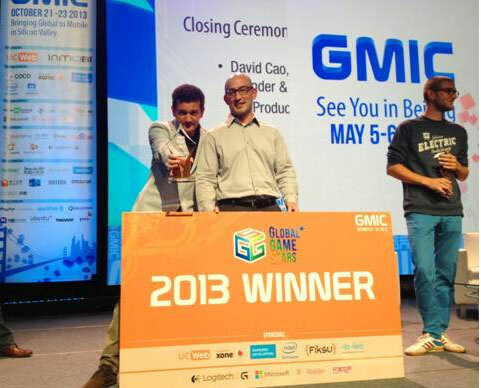 Big Blue Bubble’s hugely popular and critically-hailed My Singing Monsters is the winner of the Global Game Stars (GGS) competition at GMIC 2013, passing hundreds of other titles from around the world represented at the Silicon Valley technology conference this past Wednesday. The event kicked off Monday, October 21st, with three full days of seminars, panel discussions, and exhibitions, as well as talks from industry moguls and mobile specialists. The Global Game Stars competition was adjudicated by several major players, to include representatives from Onavo, PopCap, and Kabam, among others. My Singing Monsters first received the distinction of a GGS Top 10 finalist, recognized alongside games from Canada, USA, Denmark, China and more. Directed by Big Blue Bubble CEO Damir Slogar, a demo of the game was presented in front of hundred of attendees at the Thought Leaders Stage. Following the presentation, My Singing Monsters was revealed as the winner of the competition. “We were up against some really innovative games, but it’s great to walk away #1!” said Bryan Davis, Business Development Manager for Big Blue Bubble. iTunes App Store for iOS devices -Requires iOS 5.0 or later. Compatible with iPhone, iPad, and iPod touch. This app is optimized for iPhone 5. Welcome to My Singing Monsters! A world inhabited by strange creatures for you to collect, breed, play and control. Marvel as your monstrous minions sing for you. They’ll hum, whistle, bounce and scream their hearts out! You have never seen an extraordinary game like this before. My Singing Monsters is a world-building music game where you collect and breed your own adorable monster mash. Each monster has a unique song, sound and personality, allowing you to create your own digital monster orchestra. Breed them or purchase them at the shop and watch them sing, play and dance. Don’t forget to feed and level up your monsters to make them perform better. Each island has its own song and is packed full of incredibly cute monsters to entertain you. My Singing Monsters is now MOGA Enhanced! Available at major retailers, carrier stores and online. My Singing Monsters is rated E for Everyone. Populate an island and watch what happens. Create unique havens by landscaping and arranging your creatures. Name them, feed them, make them happy; each monster is loaded with personality. You’ll experience game play and music as never before with this innovative technology. This entry was posted on Monday, October 28th, 2013 at 11:22 am and is filed under Awards, Casual, Everyone, Music, National News. You can follow any responses to this entry through the RSS 2.0 feed. You can leave a response, or trackback from your own site.